North Slope's K Street is walking distance to parks, restaurants, shopping, and more! Calling all Victorian lovers. Let this Historic North Slope home tell you its story while 11 foot ceilings soar. Fall in love with the open staircase, hardwoods, clawfoot tub, and original millwork. Custom cabinets, farmhouse sink, subway tile backsplash, and 6 burner gas stove make the kitchen a dream. Window light and firelight, cased openings and covered porches. Outdoors a tranquil urban oasis of stone pathways, blossoms and berries awaits. Walk everywhere from here! It's just 5 minutes out the door on foot to Wright Park and Stadium! Park in the detached garage, or use permit parking available to residents right out front on K Street. 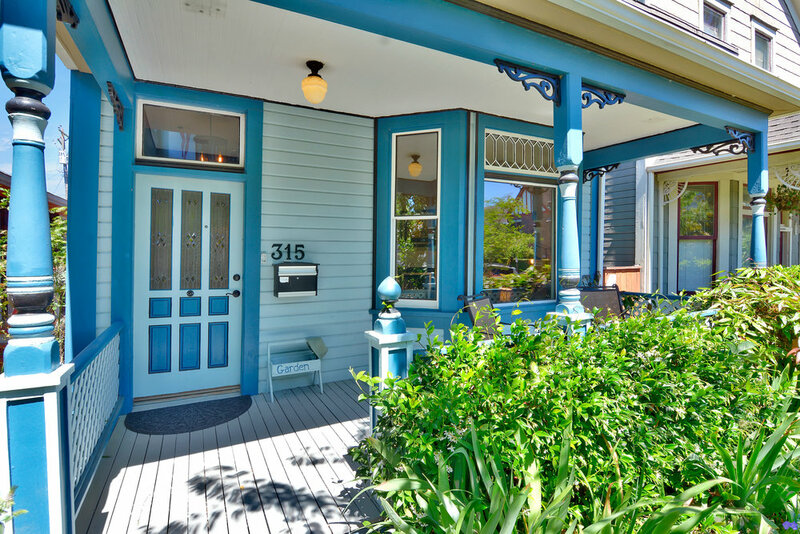 Sit and sip some local coffee while enjoying the neighborhood on this beautiful covered front porch! You enter the world of this home before even stepping inside. From the lush front garden hugging the covered porch and lining the sidewalk, open the door onto the glowing refinished oak floors. 11 foot ceilings rise overhead, and an open staircase shows the way to the upper floor. But stay here a while. 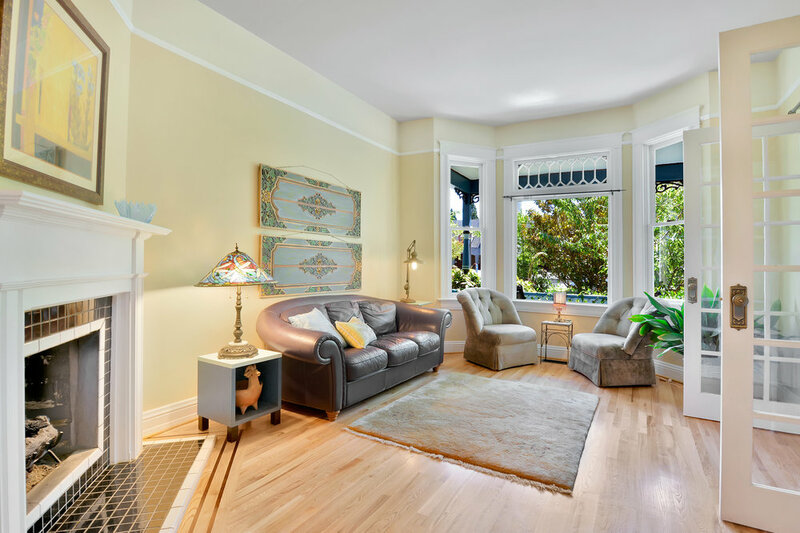 Turn right into the living room with its bay window overlooking the front porch where clematis and jasmine vines climb. A mantle, tile hearth, and even inlaid hardwoods draw you toward the gas fireplace. Picture rail molding and two-tone warm neutral walls emphasize the tall ceiling. Living room with bay windows, gas fireplace, glass door entry and picture rail. Oak floors and original millwork throughout. Living room looking into the dining room through an open casing. Step through a cased opening into the dining room where the hardwoods continue, and a built-in with shelves and drawers lends itself to decor and storage opportunities. Here the millwork includes chair rail and picture rail molding, a chandelier hangs from the ceiling, and tall windows offer light, while the openness to the kitchen keeps the space from feeling too formal. Dining room with built in shelving. Updated kitchen with farmhouse sink, stone counters, and custom cabinets. 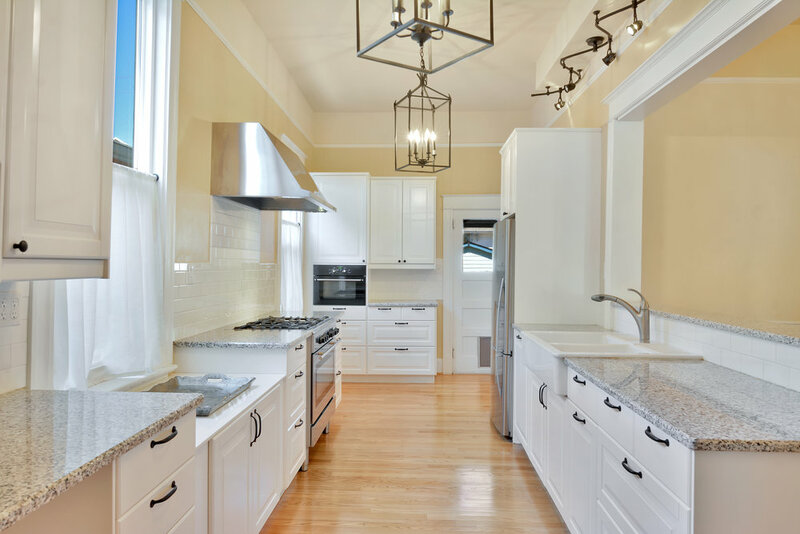 The kitchen itself is adorned with gleaming hardwood floors, custom white cabinets with classic black knobs and drawer pulls, a retro divided farmhouse sink, and stainless appliances. The stove is a 6-burner gas range with a KitchenAid hood vent above for all the enthusiastic cooks out there. Generous counter space, hanging light fixtures, and those same high ceilings with tall windows make this both functional and charming. 6 burner stove, heavy hood vent, farmhouse sink, and dishwasher. The laundry entrance and back porch. The laundry room includes a sink, clothes folding counter space, and a view to the back yard. A laundry room adjacent to the kitchen on the way out to the covered back porch is equipped with a stacked washer and dryer, as well as a utility sink and clothes folding space. Head out of the kitchen in the other direction for the 1/2 bath in the hall, and you're on your way to the staircase. Half bath under the stairs. Head up the staircase, and when it turns, you're facing the landing that gives you the first glimpse of the wide-plank fir floors full of color and character that cover this entire level of the home. Two bedrooms on the left overlook the back yard and beyond to rooftops, treetops, and a church steeple, Their picture rail molding and 11 foot ceilings (yes, on this floor too!) give them style and shape, while the southwest style color scheme is warm and inviting. A third bedroom overlooks the front garden, K Street, and the modern architecture of Christ Episcopal Church. This room has the feeling of a suite with its cased opening into a spacious, light-filled dressing room where you'll also find the closet. This unique end of the room could also be set up as a space for drawing and painting, or as a private reading nook. The full bath has Victorian flair with its refinished clawfoot tub, wainscot, and storage closet, while the island blue walls, and white subway tiles give it a touch of the modern. The floor is an inspiring mix of small white ceramic square tiles, and transparent blue tiles reminiscent of beach glass in a wandering geometric pattern. Once you climb the stairs, you might stay a while. It's truly nice up here. Main bedroom with natural light. Main bedroom's dressing area with separate closet. As you can see from the very beginning, even as you walk the sidewalk and take the front path to the covered porch, the previous homeowner loved this garden. When asked what her favorite part of living here is, one of the first things that came to mind was a love of the backyard especially. But we'll begin in the front where cherry trees, irises, ferns, and countless other beauties line the sidewalk and provide increased privacy for the home. Alongside the front path tomatoes and herbs grow in a raised bed, and clematis vines, more iris, and fragrant jasmine hug the covered porch. 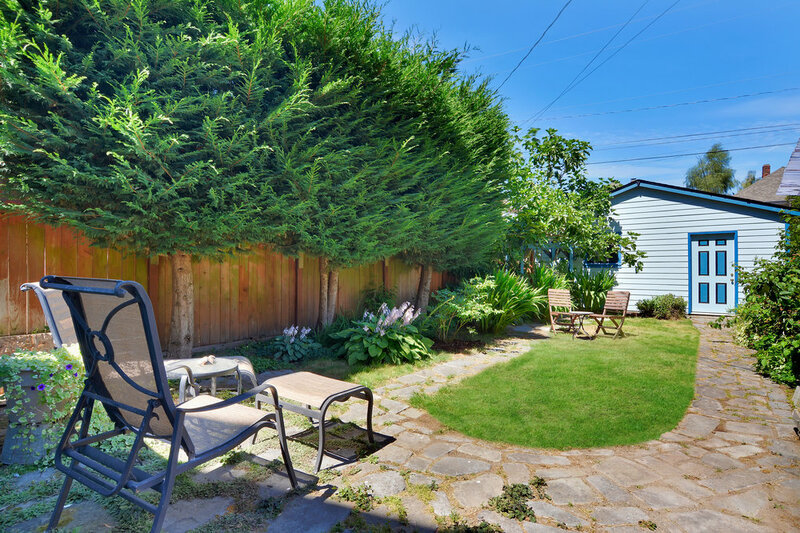 From the back porch, sit and look over an intimate space of lawn, path, garden, and hedge. Forget about straight lines. There are no grids here. Instead, rustic paving stones wind beside a cozy chicken coop, past raspberry canes bursting with berries, alongside blooming hostas, foxgloves, anemones, and finally to the lush corner where a shapely fig tree reaches across an arbor. If you've made it this far, you love old homes, or you love reading, or you just like looking at photos. In any case here you are, so you might like to know a bit about the neighborhood. This Victorian home, a treasure remaining from 1890 is set in Tacoma's Historic North Slope District. Many who know Tacoma well are giving a small sigh filled with pleasant memories of wandering these blocks on summer evenings while cats watch from the windows of homes quaint and grand. Think of garden paths, wide front porches, deep eaves, pleasant doorways, and glimpses of private backyards. Walk everywhere, drive easily when you're in a hurry, take the bike out; you won't go far to find a cup of coffee or a cocktail, hot breakfast, Saturday brunch, or pleasant lunch. Take a look at some walking and driving times to some Tacoma favorites within easy reach. Pie of the week. Italian chicken bruschetta. Basil pesto, parmesan, mozzarella, Genoa salami, herb roasted chicken, fresh bruschetta, and balsamic glaze. For more information about this beautiful Victorian, call or text me at 253-226-2787. I'll be happy to answer your questions about this home or the Tacoma real estate market in general. Good luck on your search and may you find the place that's right for you! Come relax! Oh, and there's the 2 car garage. High ceilings and natural light give openness to this cozy single-level layout. Find a private full bath with jetted tub in one bedroom, and a 2nd full bath in the hall. This home is loved for its spacious eat-in kitchen, landscaped yard, flexible 3rd bedroom, 2 car garage, and central location. Just a ½ mile to 6th Ave, 1.5 miles to Proctor for shopping and cafes. Set high above the street, this rambler offers simplicity and convenience on a single floor. Fully updated in 2013. Enjoy a fenced yard, open living space, and the flexibility of both a private ¾ bath in the main bedroom and full bath in the hall. 5 minutes to downtown museums and Hilltop cafes. Well-kept and comfortable, this rambler welcomes you with tasteful updates and unexpected details like French doors opening to a fully-fenced brick patio, or the vaulted ceiling and walk-in closet. Fresh paint throughout the home with heating and cooling provided by an energy efficient ductless heat pump, all on a large lot with detached 2 car garage. Close to shopping and lots of groceries. Opportunity knocks in this North End duplex. 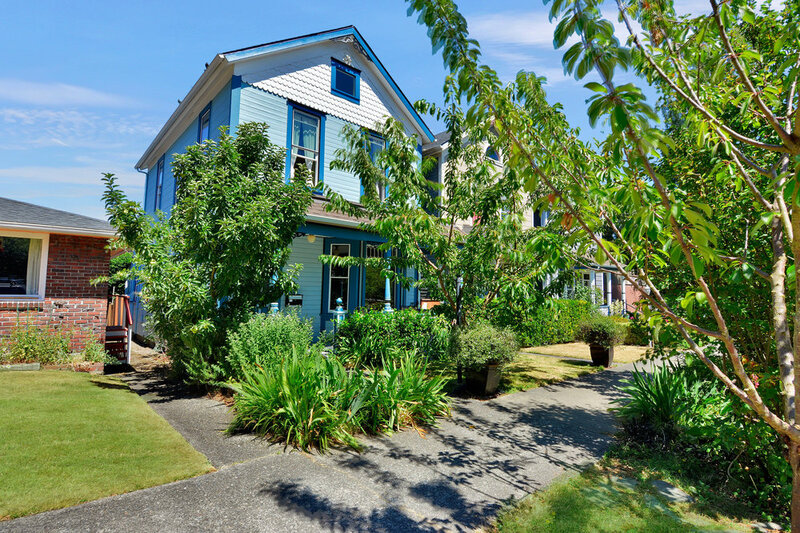 Half a mile from University of Puget Sound and one block from 6th Ave, walk to shops and cafes! Live in one unit, rent the other, think mother in law unit, or remodel back to a single family. Hardwood floors, big windows, off-street parking.